Hello again! I am Tano Bongiorno, your host and guide to the ancient city of Palermo, Sicily. Today I’m gonna tell you all about an entertaining feature of Palermo no visitor should miss. 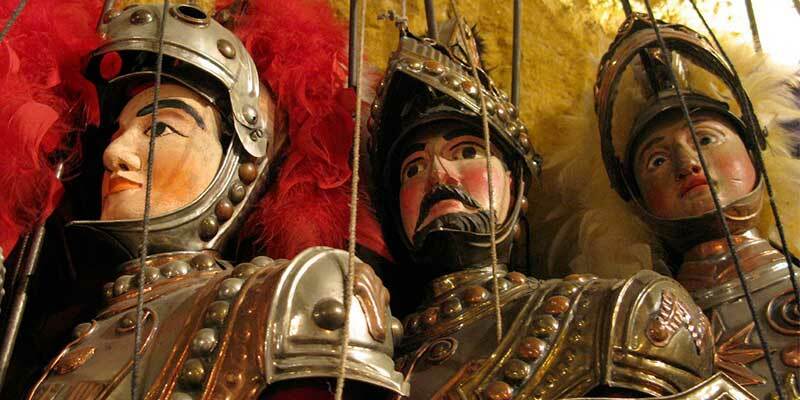 I’m talking about our famous Sicilian Puppet Theatre, which we call the Opera Dei Pupi. Of course, children love this show, but you would be surprised how many adults enjoy it just as much. The stars of this theater are Carlo Magno and his paladins. We call the puppets “Pupi” which comes from the Latin “pupus”, or child. The theater has been richly decorated and the wooden structure has been hand carved to enhance the decoration. During the show, the puppets have real breastplates and the talented and experienced puppeteer has the knack of giving creating enthusiasm and pathos to the epic scenes he depicts. During the shows the puppeteers mostly follow a script, but they have a talent for improvising as the plays progress. The plays are narrated just as in the ancient past, and the narrator can be so convincing the audience watches in awe and as they listen, many actually believe these fables. The stories are about rebels. They relate the desperate odds of those who fight against overwhelming and unjust powers, but somehow, in the end, they always manage to win. In times past when there were no talking dolls, puppeteers instilled life into their puppets,an exciting addition to fire the imagination and passion in the children they entertained. When you attend a play it is like taking part in an ancient ritual that quickly draws you in and hypnotizes you. The puppets seem to dance before you. You will discover a means of expression that can create in you the feeling of being an actual puppet. The Sicilian puppet theater became popular in Sicily around the second half of the nineteenth century and the early twentieth century, especially when some clever unknown created technical innovations that led to the birth of the Sicilian puppet. The most outstanding feature of this new puppet was the improvement of the system was the moveable puppet’s head. This added realism to the show and allowed more rapid and decisive movement. This of course, added much more excitement to the duels and fights. Thanks to the Cuticchio family, the Opera Dei Pupi came to Palermo. In1835 Don Gaetano Crimi opened his first theater in Catania. This theater has always been a fascinating venue and immediately captivated the Sicilian audience expression the love and passion typical of the Sicilians themselves. Constructing a “pupo” has, over the years, remained the same. The first artisans constructed the bodies, the heads, and animals using several different kinds of wood such as beech, walnut, lime (or linden), and cypress. Each puppet features nine pieces divided as follows: two feet, two calves, two thighs, a bust, and a hand. The parts are all held together with wire. Maybe I’m prejudiced, but I find the Opera Dei Pupi and the story of its origins fascinating. It helps us to remember the past and how things were different then. Come to Palermo and see the sights, enjoy the markets and of course do not forget the Opera dei Pupi. I know it will thrill you. Just tell them Tano sent you.